Food-wise, there is not a lot that I like to pay actual paper dollars for other people to do for me. I mean, I like to cook, and I like to know what I’m putting in my food. And usually, I can do it just as well or better than someone else. The exception to this is sandwiches. I regularly pay for people to make sandwiches for me, but it’s not because I couldn’t make a better sandwich. I’m pretty all right at sandwiches. What I’m really paying for is for someone to take out all the individual ingredients from the fridge and portion them out into single servings and then arrange them. Sew annoying for me to do. So yeah, I’ll pay you $4 for that ham sandwich. Lots of times, I’ll pay for artisan-style bread, too. You know, the kind with the crunchy, chewy crust and deep flavor. Sidenote, anyone know why they call it artisan-“style?” Like, in the style of an artisan? Where all my artisans at? We need more artisans in this world. Other sidenote, does anyone shop the roasted garlic artisan bread at Costco? It is so fab the day it’s baked. All you need is a swipe of butter. It’s also great for fondue. Ok, I have to stop talking about that now. And start talking about this bread. That I made. And it was actually artisan-y! I didn’t even think it was possible for me to accomplish this. I heard last year that the way they get that chewy, crunchy outer crust is by trapping steam in the oven right at the beginning of the bake time. I forget why this works. Anyway, I promptly dismissed bread-making. I mean, who has a steam-trapping oven conveniently located in their kitchen? I saw a recipe on Tasty Kitchen for No-Knead Bread, which is one of those Pinterest food trends I missed because I don’t even like Pinterest. The more I checked out the blogger reviews of the technique, the more I liked the idea. I mean, all you do is chuck everything together, let it sit over night and then bake it up. And I was real intrigued after I saw the NYT recipe that created a faux-steam-oven in a cast iron pot. 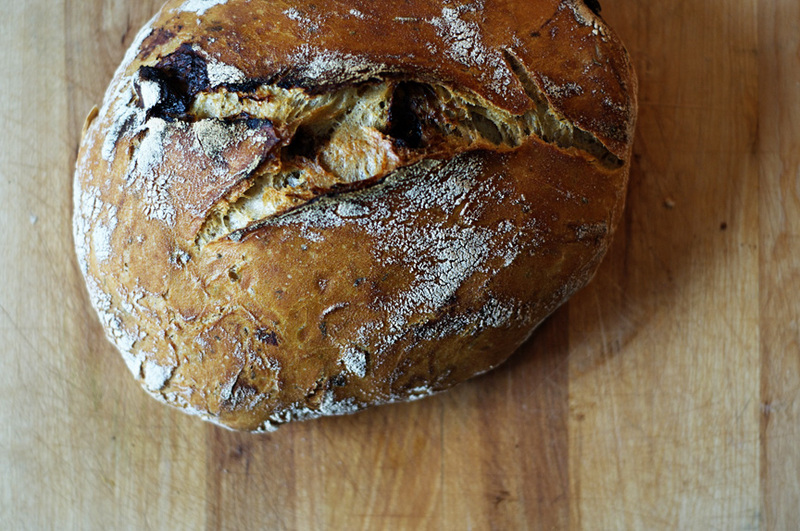 Could I, even I, make artisan-style bread? I actually did this bread twice. 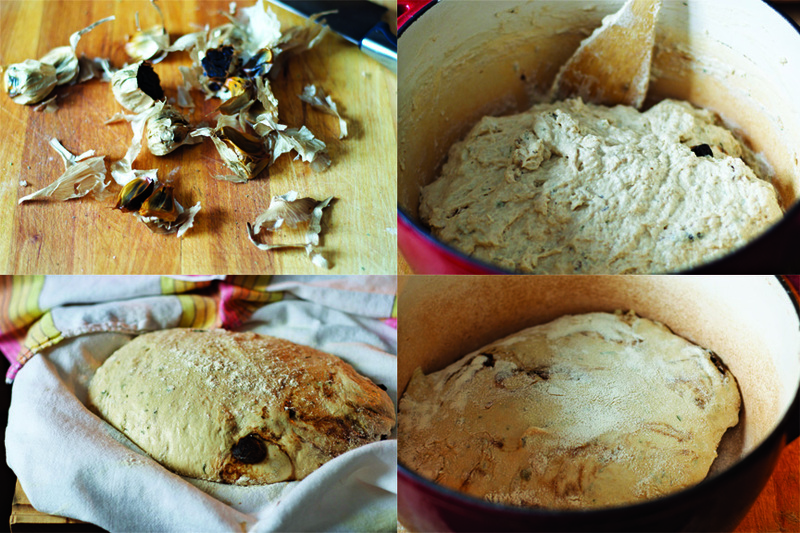 I made up my own recipe as an amalgamation of a few no-knead bread recipes, including HERBS (the best) and big hunks of BLACK GARLIC (whose superfood properties you can read about here). So I made up this big batch of dough, but tried two different techniques to bake the bread. The first one is linked below, but the technique was not as good as the NYT version I linked below. It involved filling a pan with boiling water shutting the oven door really quick to create the steam. The resulting bread was good, but the NYT bread had that crunchy crust I was looking for, and the consistency of the crumb was better and holey-er. Because bread is so affected by miniscule changes in ingredients and technique, I am interested to try the NYT recipe to the letter next time. And there will be a next time. 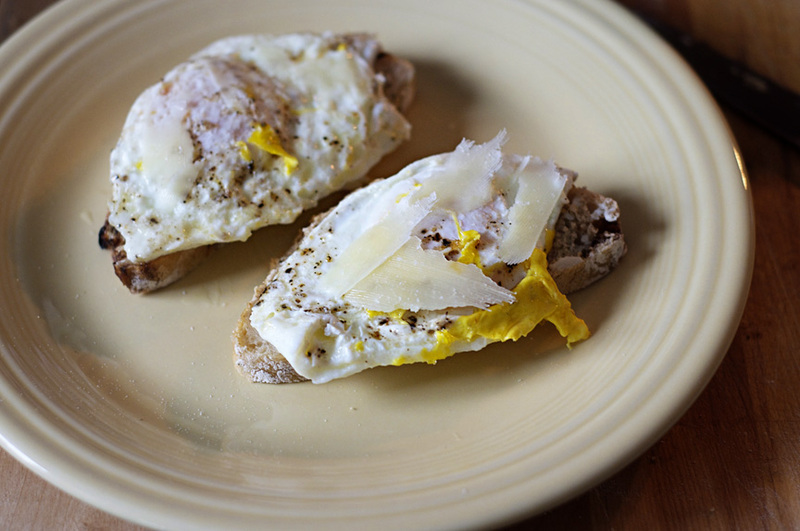 Here is the open-faced egg and parm sandwich I made for my family. The bread was so good I went to the trouble of making a sandwich. No one paid me, unfortunately. Chop up the herbs very finely, using a knife or kitchen shears. In a large mixing bowl, mix the warm water (about 100 degrees F) with the salt until dissolved. Sprinkle yeast over the top of the water, and let the mixture sit for 2-4 minutes. 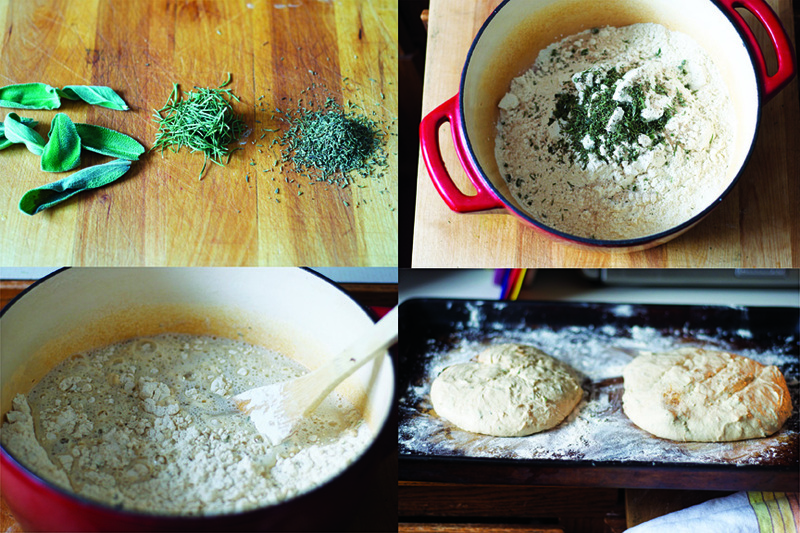 Mix the herbs and garlic thoroughly into your flour. Using a wooden spoon, stir the flour into the yeast mixture until there are no dry spots and the dough forms into a shaggy mass. Cover the bowl with plastic wrap and let rise in a warm room (about 70 degrees F) for 12-18 hours. When the dough is risen and dotted with bubbles, lightly flour a work surface and place dough on it. 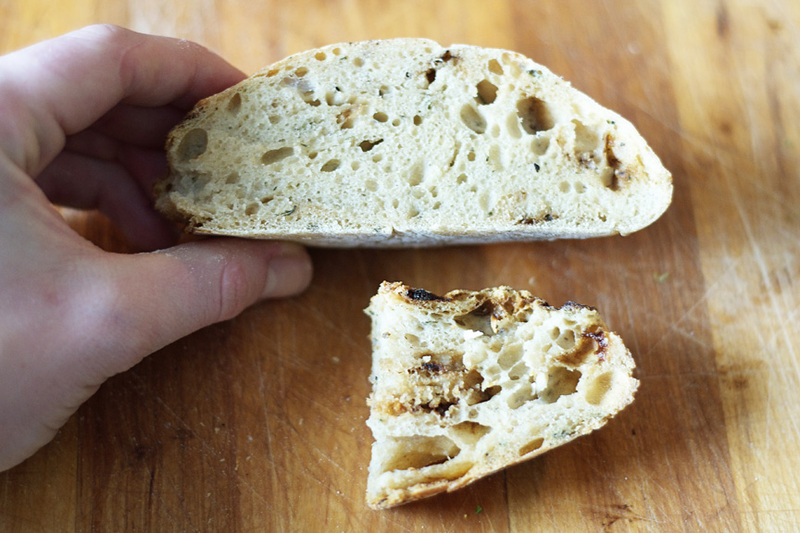 If you like, you can split the dough in half and make two smaller loaves if you have two pots. Sprinkle it with a little more flour and fold it over on itself once or twice. Cover loosely with plastic wrap and let rest about 15 minutes. Using just enough flour to keep dough from sticking to work surface or to your fingers, gently and quickly shape dough into a ball. Generously coat a cotton towel (not terry cloth) with flour and put the dough seam side down on towel, dusting with more flour. Cover with another cotton towel, and let rise for an hour. A half hour before the dough is done rising, preheat the oven to 450 degrees F. Put a 6- to 8-quart heavy covered cast-iron pot in the oven as it heats. When the dough is ready, carefully remove pot from oven–don’t burn yourself! Turn the dough over into the pot, seam side up, shaking the pan once or twice if dough is unevenly distributed. Cover with the pot lid and bake for 30 minutes, then remove lid and bake another 15 to 30 minutes, until loaf is a deep brown browned. Let cool on a rack before slicing into the bread to retain the moisture. Yields one 1½-pound loaves, or two smaller loaves. Cindy–Wow! I will have to try that next time. Thanks for the tip! This sounds and looks amazing!!! Way to go, Loli! I do consider all of the ideas you’ve presented in your post. They are very convincing and will certainly work. Still, the posts are too quick for novices. May you please extend them a bit from subsequent time? Thank you for the post. Hi there Dear, are you in fact visiting this web site daily, if so then you will definitely take fastidious knowledge. buying an item that quenches your thirst only when you were already thirsty anyway. is the reason I’m devoted to giving the Pixel this extended trial. HER to discover YOU attractive beyond only the physical aspects. of time within the interaction. asked out. Grammar and correct sentence structure are emphasized early on. She was even fired from her job as a television reporter for the simple reason that she was “unfit for TV. We call the locals as Ilocanos and they have native language different from tagalog. I appreciated the church because it has preserved its baroque and gothic inspired structures up to the present era. happy that I came across this in my hunt for something regarding this. Despite being basically the same, we have different body types, health issues, weight issues, lifestyles, and environments. For your snacks, you can have low fat yoghurt, crackers, cheese, fresh fruits, and juices are good options for snacks. is about the conversion of all of the recreation space games in to video games with great deal of graphic features and extraordinary sound features ultimately causing occurance in the similar game played in the fields years before. long time to finish should you be buying for young children. could think about the fact that having a solid value for yourself is attractive to your partner. Those are definitely qualities that you should seek to cultivate if you want to get your ex girlfriend back and have her stay for a long time. If you were the one who broke things off, you might want to cut these last few ties with your ex. are not around us anymore then do we realize their value. weapon and the location of the witness that you need to secure. If you aren’t sure what the best way to go about getting him back is, don’t worry. know how you feel then how will they have any motivation to get back with you. could give commercial games a run for their money. ” If one have been to think about the number of apps obtainable on i – Pod, they’d seemingly by no means get to the end of it all. theirs hacks dont get detected for 6 months or more. use find a blind Date, you can contact us at the web-page. There are also quite a few married women who cam, as well. easily guess) and cover the lens when you aren’t using it. how to start dating. Yes, quite a few of these ladies are quite the adept web developers. of the popular scary games. As with other games, hot-keys are highly customizable. post to be updated on a regular basis. It includes fastidious material. decorative kind of temporary contact material. So enjoy and download your favourite free wallpaper backgrounds. my interest. I’m going to bookmark your website and keep checking for new information about once a week. You are allowed to create secret notes, albums, save your contacts and save bookmarks too. This looks amazing! Thanks so much for sharing this recipe! 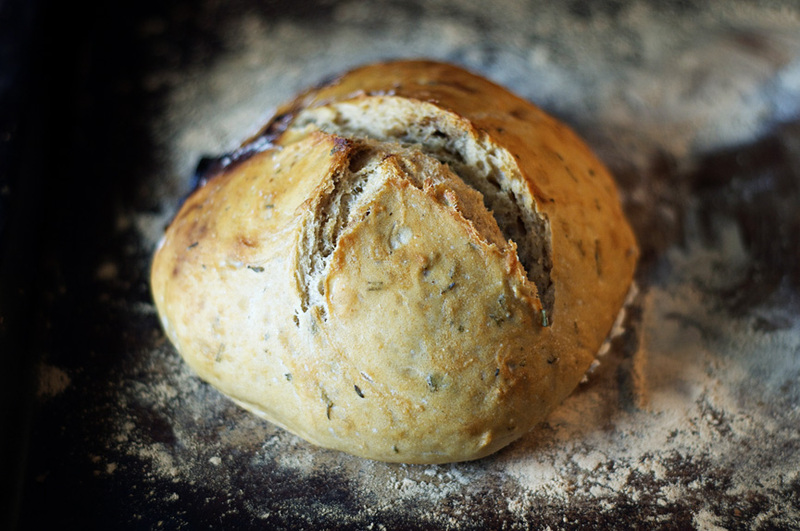 I have been on a total carb kick- especially fresh bread. Love the blog! Most users would like to look around for the supplier that best matches their needs, said Laurie MacEachern of the Medicinal Cannabis Patients’ Alliance.